This gorgeous gift set comes with everything you could need to ask for angelic help, guidance and support. 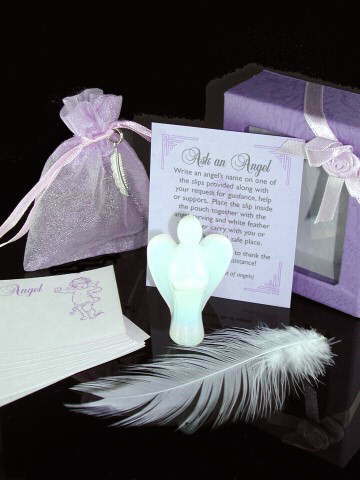 The set includes a beautiful Opalite angel carving, a lilac organza bag with pewter feather charm attached, 10 x Angelic Petition slips and a real white feather. It also comes complete with a list of angels and archangels and their particular speciality, so for example, if you wanted help with a relationship matter you would write an angelic petition to Angel Itqal, or if you needed guidance over a business or work-related issue you would call upon Angel Teoael. All of the above comes beautifully presented in a gift box which is available in either baby pink or lilac (lilac box is shown in the picture). Specify which colour you would prefer at checkout in the 'Message to Sellar' box.